Gentlemen are very welcome at Coventina Day Spa. We invite you to relax and revive with services designed with you in mind. Invigorating and exfoliating full body scrubs are designed to slough away expired skin cells with a combination of natural sea salts or sugars and heated oils. A warm rinse under the Vichy Shower followed by a moisturizing lotion application completes each treatment. A massage concentrating on alleviating tension and pain. A variety of stretching and penetrating techniques are utilized to affect the deep tissues of the body. Designed for people who want or need a more effective and detailed massage. Available in 30, 60 or 90 minute sessions. 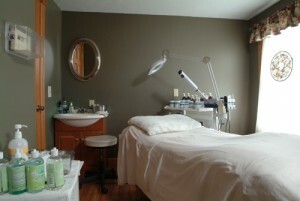 Designed for your exact complexion, this personalized facial is totally customized from start to finish! You’ll experience a custom blended deep pore cleansing, exfoliation and massage of the face, neck, and shoulders followed by a therapeutic Bioelements mask and serum designed to correct specific problems. Emerge with immaculately clean, smooth and glowing skin. Our basic manicure just for men! No polish- traditional nail and cuticle care, massage with lotion application. Our basic pedicure just for men! No polish-eucalyptus soak, traditional nail and cuticle care, massage with lotion application.